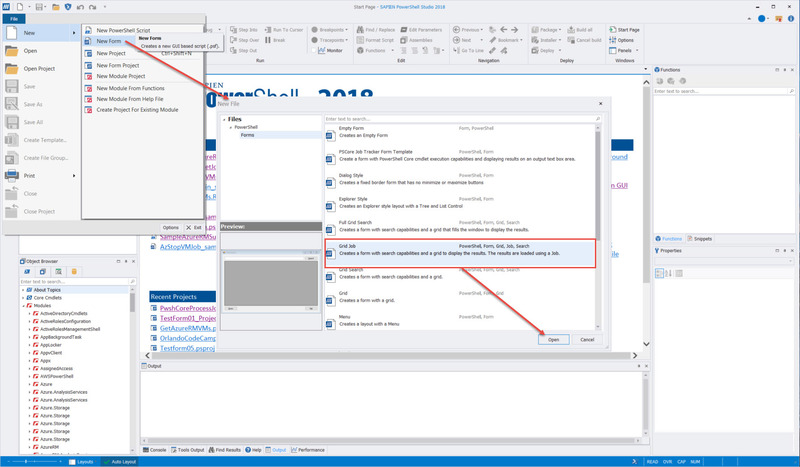 PowerShell Studio provides application templates and helper functions to help you speed up your development process. 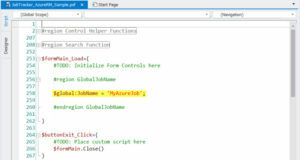 The recent blog post series on creating an Azure application shows the evolution of an Azure solution from a console script to a Windows application. In the previous post I used an empty form with two controls (Button & RichTextBox), and then started building from an existing console script. Then I added code with logic to handle the background job process. Now I’m going to take it a little further with the help of PowerShell Studio’s ready-to-use templates. I am going to use the GUI Form “Grid Job” template (File > New > New Form > Forms > Grid Job). 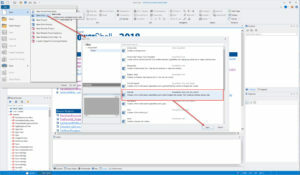 This is a PowerShell Studio single form file which includes some of SAPIEN’s Helper Functions to assist with your GUI application development. In this article I will cover the JobTracker Add-JobTracker helper function and the DataGridView ConvertTo-DataTable and Update-DataGridView helper functions. First I will change the Button control text property from “Query” to “StartJob“. 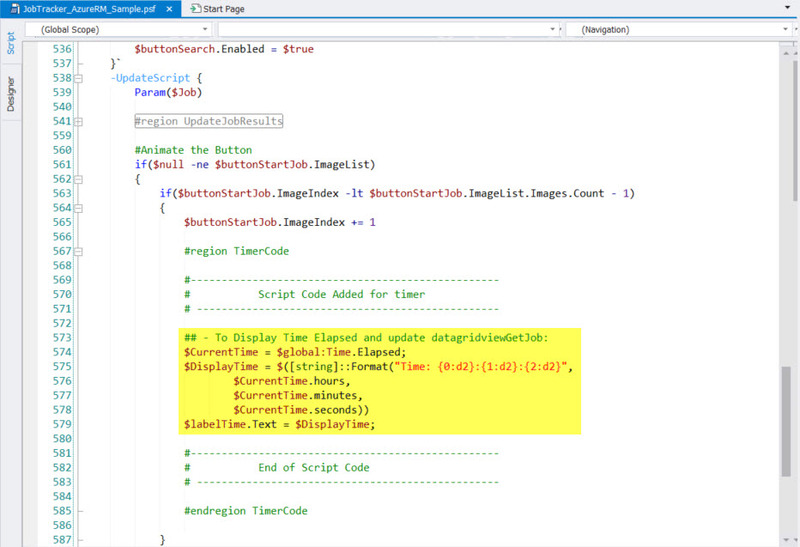 Then I will add a Label control and change the label text property to “Time:“. 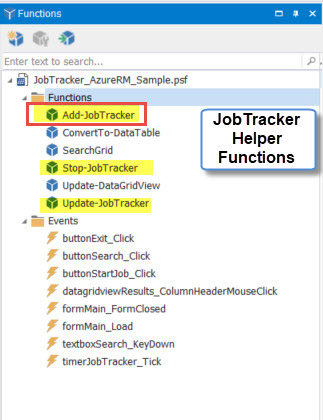 Finally, I will save the file as “JobTracker_AzureRM_Sample.psf“. Before I start to implement my code, let’s take a look at the main function used for background job processing: Add-JobTracker. Name – This is the name of the background job. JobScript – This is the code to executed in the background job. 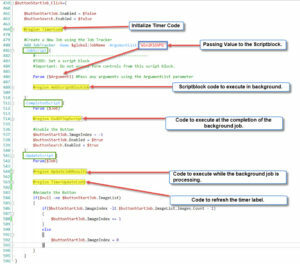 CompletedScript – This is the code to execute at the completion of the background job. UpdateScript – This code executes while the background job is running. 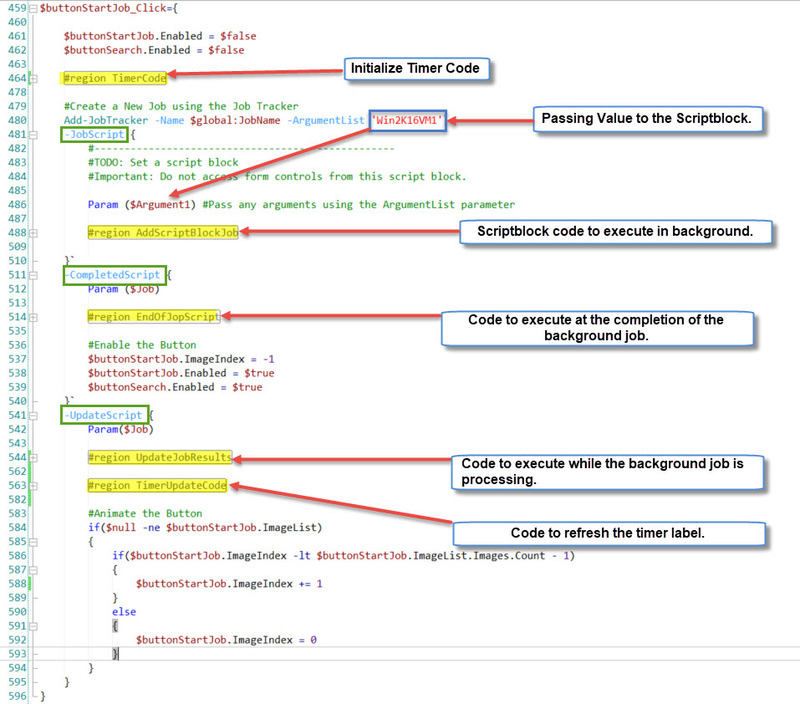 ArgumentList – (Optional) Only used if there is a need to pass a value to the ScriptBlock. 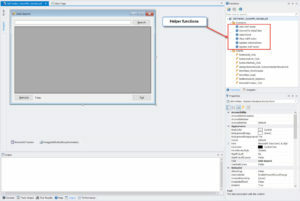 The JobTracker functions can be found in a custom Control Set labeled “Button – Start Job” which is part of the “Grid Job” template. 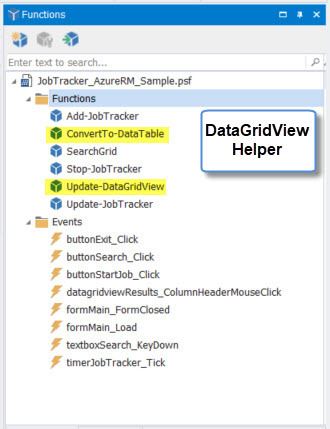 The “Grid Job” template also has a DataGridView component, with helper functions that convert and display the receive-job result in a simple format. ConvertTo-DataTable – This function converts the result object into a data table object. 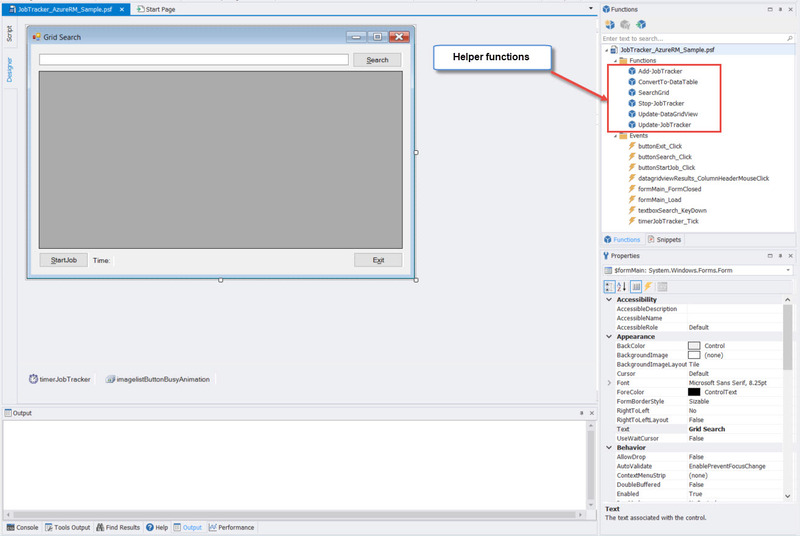 Update-DataGridView – This function reads the data type object to be displayed in the DataGridView component. 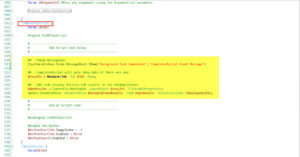 In the $formMain_Load form event, I added a global variable for the job name: $global:JobName. For now, this is a hard-coded constant string. In the $buttonStartJob_Click button event, I added the Timer code which updates the label “Timer:” text property with the recurring execution time. 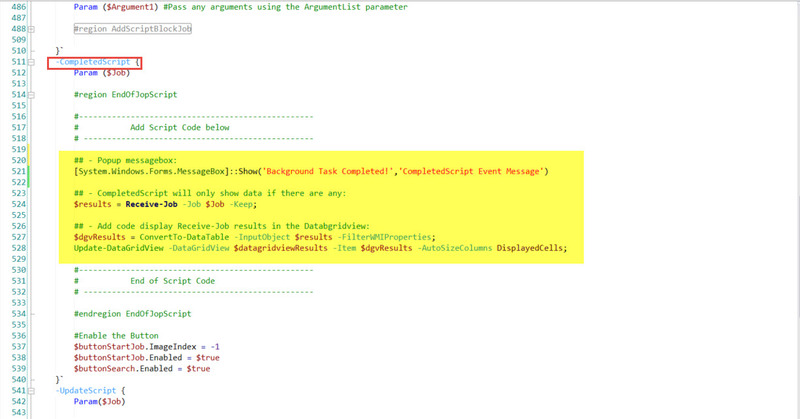 In the Add-JobTracker function I added the “-ArgumentList” parameter to pass the hard-coded system name value. 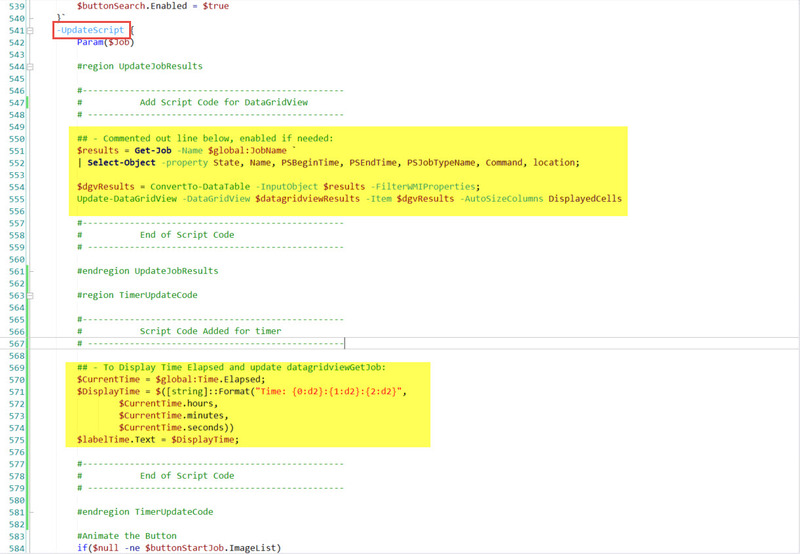 In the “-JobScript” parameter, values can be passed through the Param($Argument1). Note that you can rename this variable to suit your needs—with a descriptive name that describes the purpose of the argument. Remember, any hard-coded variable is a prospect for automation. It is up to the developer to improve the application. Next I start adding the code in the Add-JobTracker function. All of this is happening in the $buttonStartJob_Click button event. 4. 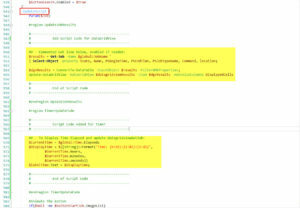 ‘-UpdateScript‘ – There are two added code blocks: “UpdateJobResults” and the “TimerUpdateCode“. You can use both the ‘-UpdateScript‘ and ‘-CompletedScript‘ parameter section to update the information on the DataGridView component. In this Azure GUI form application I am using the Get-Job cmdlet results to display the progress of the background job in the DataGridView component during the “-UpdateScript” process. When the job completes, the “-CompletedScript” section gets the result from the Receive-Job cmdlet that is sent to the DataGridView component. This “Grid job” sample shows how to integrate Azure scripts into a GUI application to take advantage of background processing. 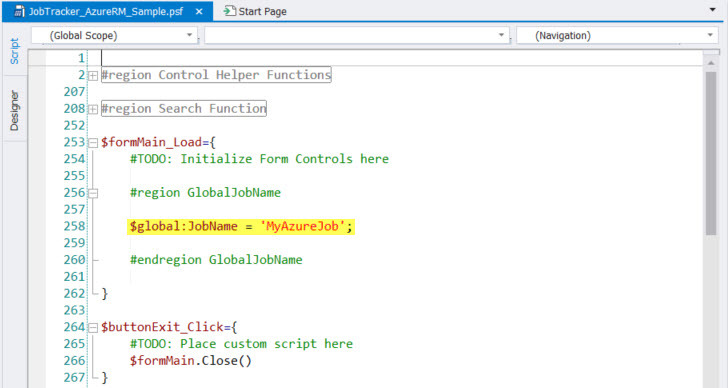 Remember to submit Azure scripts as background jobs to prevent the GUI form from freezing. 1. Use the JobTracker Add-JobTracker helper function to submit the Azure code as a background job. 2. 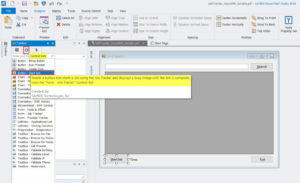 Use the DataGridView helper functions (ConvertTo-DataTable and Update-DataGridView) to display the results during and after the background process. I also covered the parameters used in the Add-JobTracker function which is enough to get you started. 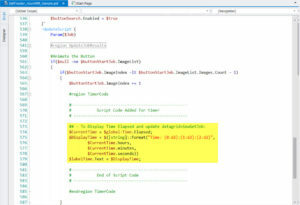 PowerShell Studio template can cut down time in development. Specially when taking time to understand these helper functions.